The doors cannot be locked when the key is in the ignition switch. 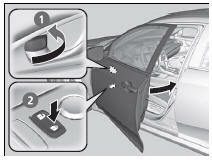 The doors cannot be locked when the smart entry remote is inside the vehicle. When you lock the driver’s door, all the other doors lock at the same time. Make sure you have the key in your hand when you lock the driver’s door or any of the other doors, otherwise you may end up locking the key inside the vehicle.